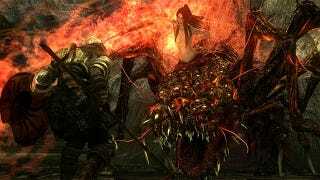 If the best video-game screenshot artist around wants to spend a bunch of weeks cataloguing Dark Souls, that's just fine with me. Dead End Thrills is still at it, and has posted some more beautiful shots from the game over at his site. Some real doozies up this week. Check out some highlights below, and click to embiggen. Find more at Dead End Thrills.